You don’t need the Ultrasharp 49, but you’ll want it. You’ll want it so, so bad. 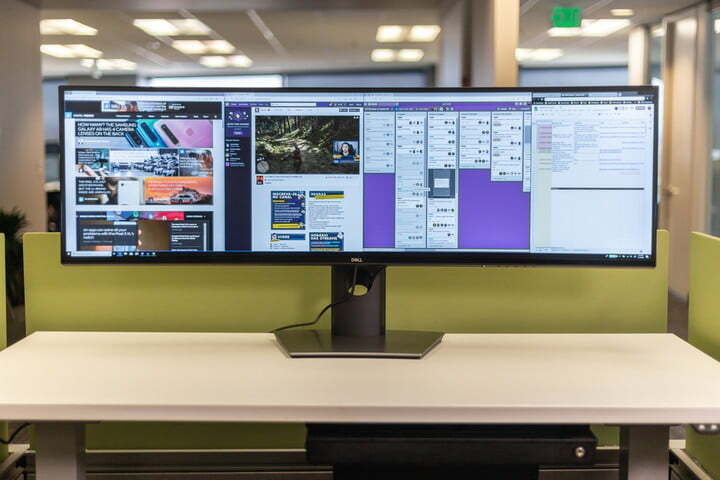 How wide can your monitor be? Well, that depends. 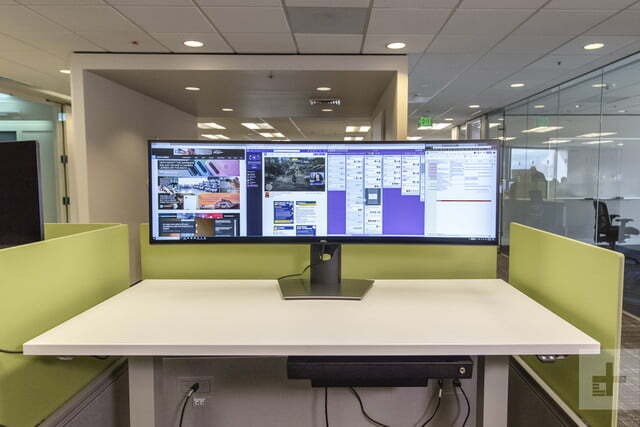 How wide is your desk? Samsung’s 49-inch CHG90 ultrawide, released in fall of 2017, challenged everyone’s assumptions about how large a monitor should be. Now, a year later, Dell is taking up that challenge with its own ultrawide, the Ultrasharp U4919DW (better known as the Ultrasharp 49). 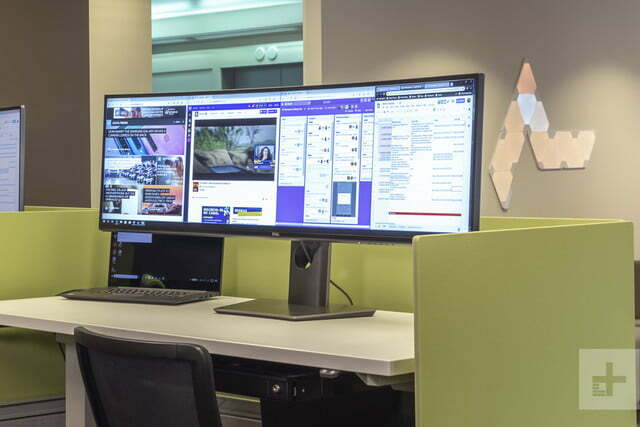 This massive monitor is the same size as the Samsung, but it’s also very different. Its 5,120 x 1,440 resolution is higher, its 60Hz maximum refresh rate is lower, and its 3800R curve is less dramatic. Though similar size, and this is a different beast with an impressive $1,700 price to match. Is this the ultimate monitor? Or has Dell gone too far? 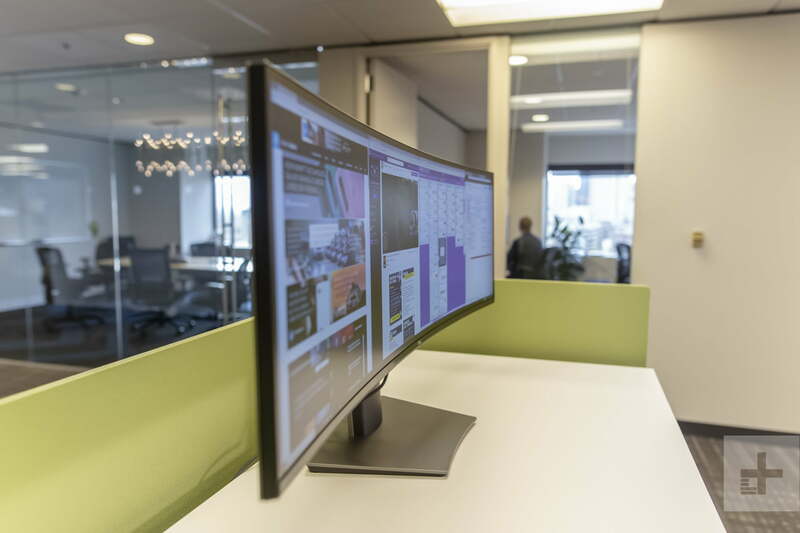 If you’ve ever worked in an office, or even stepped inside on, you’ve likely laid eyes on a Dell Ultrasharp monitor. 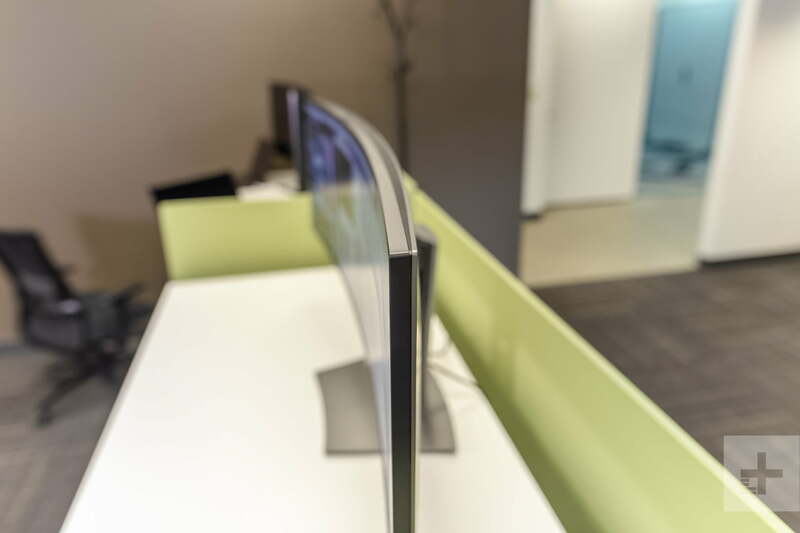 These popular displays are known for sturdy but buttoned-up design that puts function over form, and the Ultrasharp U4919DW doesn’t break the mold. 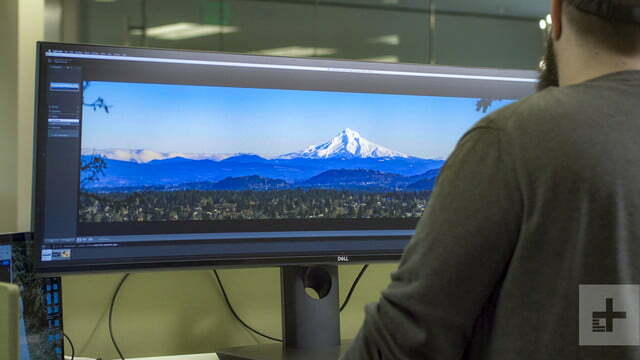 That’s not say this is an ugly monitor. In fact, it’s a bit dramatic. 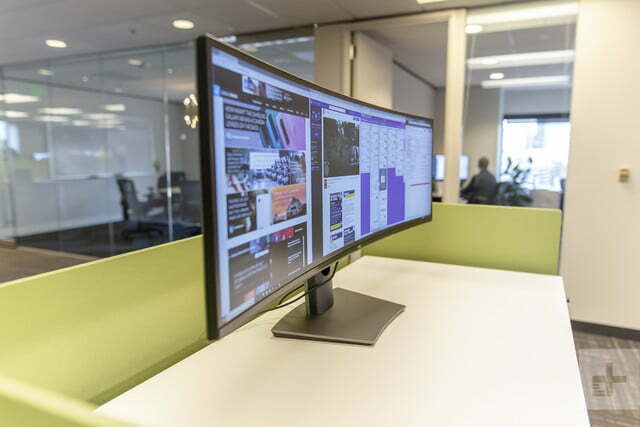 This is a 49-inch monitor with a 32:9 aspect ratio and slim bezels on all sides, so it’s going to turn heads. Once you get over its sheer size, though, there’s little to remark on. The large plastic rear panel looks goods and feels sturdy but doesn’t entice. We can say the same for the ergonomic stand, which offers height and tilt adjustments. Due to the Ultrasharp 49’s size, this stand doesn’t have the pivot and rotation adjustments commonly found on other Ultrasharp screens. Connectivity is impressive. The screen comes with two HDMI 2.0 ports, one DisplayPort 1.4, five USB 3.0 downstream ports, two USB 3.0 upstream ports, and one USB-C port. Shew! Once again, Dell has shown how monitor controls should be handled. The Samsung CHG90 has similar loadout of video ports, but it ditches the USB-C for an extra mini-DisplayPort. 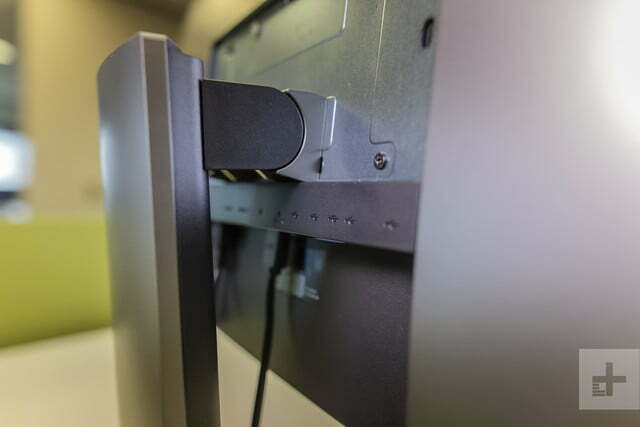 You’ll also find audio jack pass-through on the Samsung monitor, which the Dell lacks. 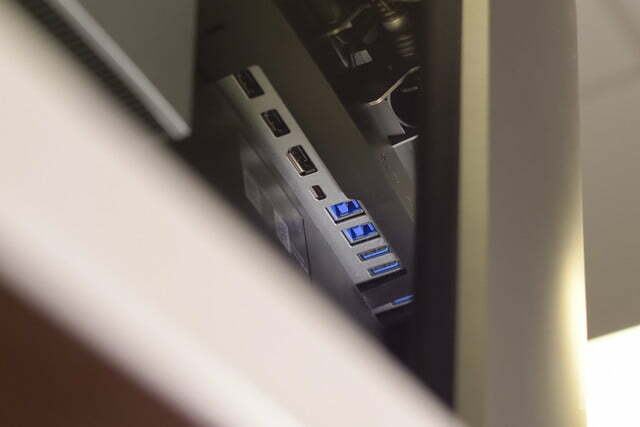 The Samsung has far fewer USB ports, though, with one USB 3.0 upstream and two USB 3.0 downstream. On balance, the design and options of each monitor are tailored to their audiences. The Samsung is built for gaming and entertainment, so it has a more dramatic curve and extra video and audio ports. 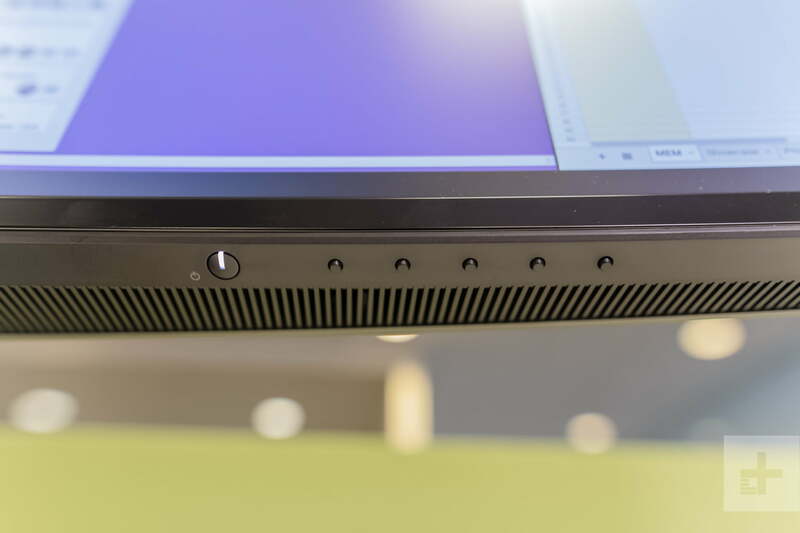 Dell, on the other hand, pitches the Ultrasharp 49 as both the ultimate productivity monitor and a dock for laptops that have USB-C connectivity. You can connect to the Ultrasharp 49 monitor via USB-C and connect your peripherals through it, instead of having a separate dock. Once again, Dell has shown how monitor controls should be handled. The Ultrasharp 49 includes five tactile buttons which are clearly labeled, once touched, by on-screen icons. These controls are responsive, the menus well organized, and the font size is extremely large. Finding and activating an option is rarely a chore. There’s significant depth of choices, too. Aside from the usual options of contrast, brightness, and sharpness, you can change color temperature, color hue, saturation, gain, and offset. There’s also several customizable key options and little tweaks, like the ability to turn off the power light when the display is on, should that annoy you. If there’s one thing you should know about the Dell Ultrasharp 49 (aside, obviously, from its size) – it’s resolution. Samsung’s CHG90 beats the Ultrasharp 49 in a few key tests, but barely. 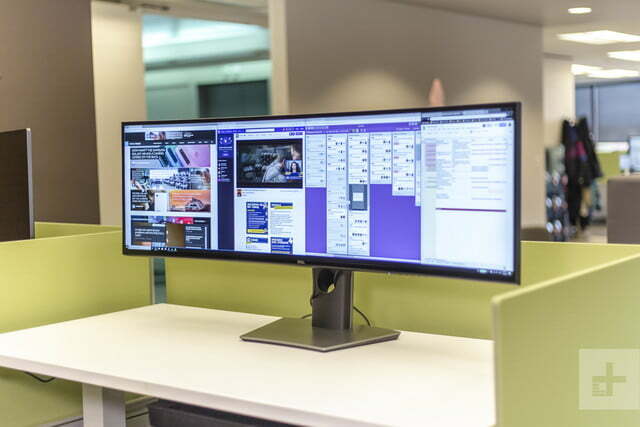 Samsung’s CHG90 has a 3,440 x 1,080 screen, which makes it basically the same in pixel density as a 27-inch 1080p monitor. 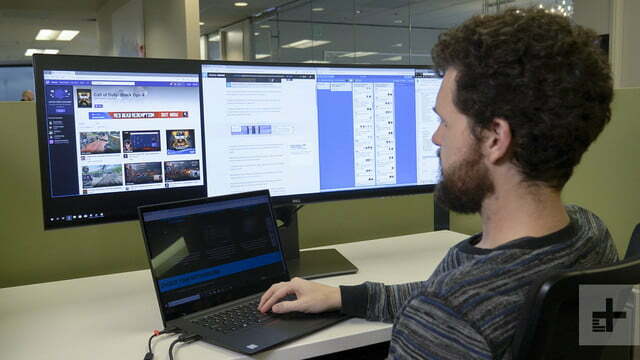 However, the Dell Ultrasharp 49 has a 5,120 x 1,440 resolution, which makes it like a 27-inch 1440p monitor. Put another way, the Dell has almost twice as many pixels as the Samsung. It’s a big difference, and you’ll notice it. The Samsung’s pixel density is adequate, but fine details can look rough at times. That’s not an issue with the Dell. Its image appears sharp and detailed no matter what you view. 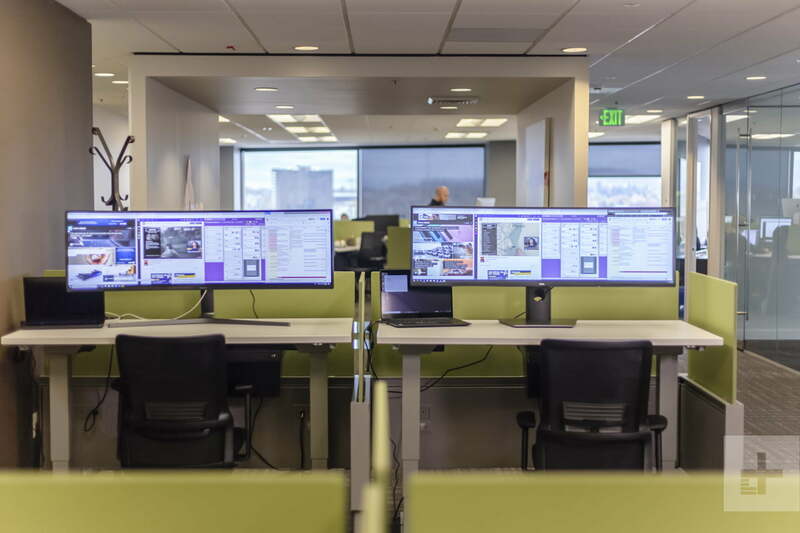 The higher resolution also means you effectively have a larger workspace, since there’s more pixels available. Sharpness is a clear win for the Dell, then. Yet image quality is about more than pixel count, and in many other important areas, the Samsung CHG90 and Ultrasharp 49 trade blows. On balance, the Samsung comes away winning these bouts. It’s slightly better in contrast, color gamut, and even average color accuracy. However, the Samsung’s maximum brightness is lower and its gamma is slightly off, while the Dell’s gamma quite good. That means the Dell appears brighter and displays the brightness of content with better accuracy. Which is better? Well, it depends on what you need. The Samsung is a stunner in games and the rare 32:9 video clip. It looks more fluid due to its faster 144Hz refresh rate, and its better contrast provides a better illusion of depth and realism. Yet the Dell takes an edge in still images and productivity. It can render sharp text with ease, which means you can have any open windows with fine fonts and still read everything (so long as your eyesight is keen). It’s also a better display for editing images due to its more accurate gamma performance. The Dell Ultrasharp 49 is effectively the same as having two nice 27-inch monitors side-by-side, but without a bezel between them. That gives you a lot of screen real-estate to work with. Both displays do share one weak point, and that’s backlight uniformity. You’ll likely notice areas near the edge of the monitor that are brighter than the middle. This is a common problem with ultrawide displays of any size and it’s usually towards the edges, where you look the least, but you should know of the issue before you buy. We think it’s an acceptable trade-off for size, but perfectionists will be annoyed. As mentioned, the Dell Ultrasharp 49 has a typical 60Hz refresh rate. It also lacks FreeSync support for smoother gameplay, something the Samsung CHG90 supports. Finally, the Samsung CHG90 supports HDR (in limited fashioned). These reinforce the differences between these monitors. The Dell won’t be able to handle high-framerate gaming or HDR movies as well as the Samsung display. Both monitors look great out of the box. Neither sets records, but they offer solid scores across the board and they’re a huge upgrade over the budget monitors most people buy. Which is good, given these massive displays have massive price tags. Calibrating the displays didn’t change our impressions. Color accuracy didn’t change much. Gamma also stayed the same. We did tame the cool color temperature both monitors had out of the box, making the picture warmer and more inviting. Dell’s Ultrasharp 49 is only the second product in a niche category, and it does enough to distinguish itself from the Samsung CHG90. The Dell’s $1,700 price tag is huge, however, and seriously cut into the display’s value. Samsung’s CHG90 is only $1,000 – still a lot, but more tolerable. 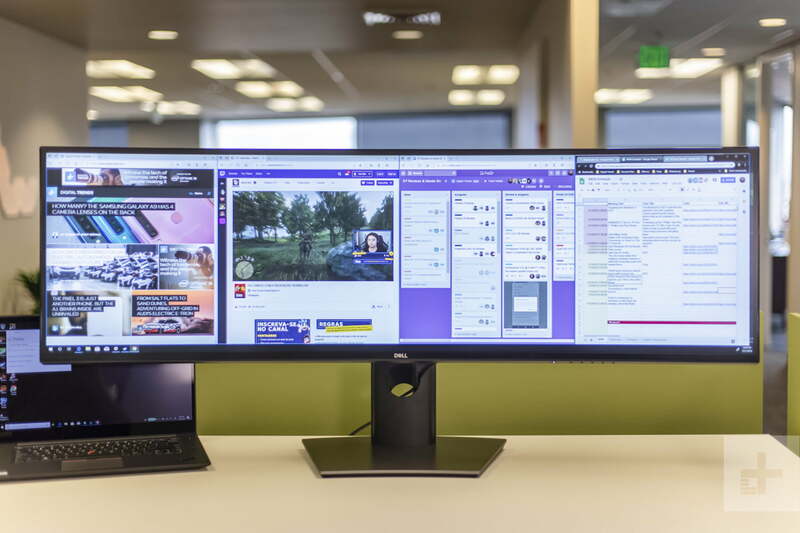 We doubt value shoppers are looking at 49-inch screens to begin with, though, and the Dell’s superior resolution might be worthwhile for discerning eyes. There’s one alternative which, by now, you should know – Samsung’s CHG90. It’s the same size, but it offers different features for a different audience. Gamers will be more interested in the Samsung because of its lower price, high refresh rate, and HDR support. 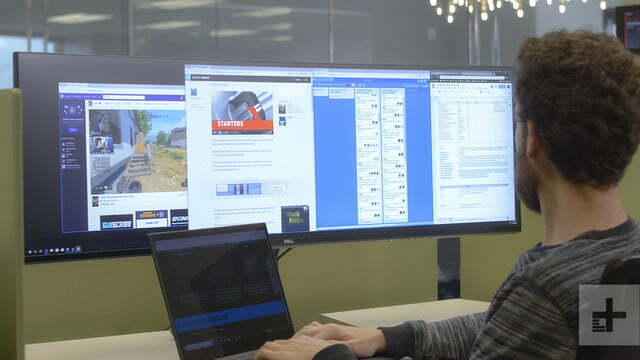 Those seeking a big monitor for multi-tasking, though, will prefer Dell’s superior resolution and work-friendly connectivity. Dell has an edge over Samsung here and again, it comes down to resolution. The Samsung’s lower resolution already looks a tad dated and may look seriously old-school in three years. That’s not a problem with the Dell Ultrasharp 49. Our one concern is the lack of HDR support. We suspect that’s about to become common. However, even monitors that support it have limitations, so its absence is understandable. 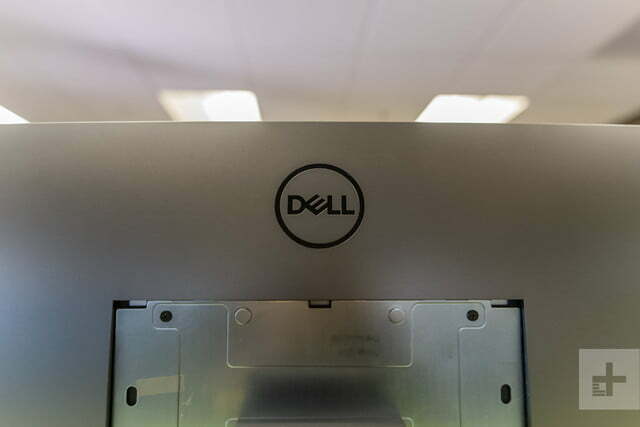 A three-year warranty is standard with the Dell. Samsung offers the same for the CHG90. Look. The Dell Ultrasharp 49 is expensive. Very expensive. You don’t need it and odds are that, like most of the world, you can’t afford it. But if you can afford it, and you do want it, go for it. We’re certainly going to be sad when it leaves our desk.